Munnar is one of the most popular hill stations, located in the southern Indian state of Kerala. Munnar lies at an average elevation of 1,700 meters above sea level in the Western Ghats mountain range in India. The town’s popularity as a summer resort grew during the British Rule, who introduced the region with tea plantations. Today, Munnar is one of the largest tea producing regions in India, known for its distinctive and flavorsome tea. The town is located at the confluence of three rivers and is famous for its vast tea plantations, lush green mountains and picturesque town. Munnar is one of the most visited hill stations in India and also houses the highest peak in southern India the ‘Anamudi Peak’ which sits at a massive elevation of 2,695 meters above sea level. The rivers, terraces hillocks, trekking spots and monolithic peak, Munnar has it all to cater to a tourist looking for an escape from the bustling city life. Due to its high elevation in the Western Ghats, the town enjoys a mild subtropical highland climate. The average temperature in the summer months between May and July doesn’t go beyond 25 degrees. The following months till September see the majority of precipitation due to Kerala’s close proximity to the Arabian Sea and the monsoons. The winter months from December till February experience a mild winter with temperatures rarely dropping below 10 degrees. Munnar can be visited any time of the year and enjoys a pleasant climate throughout the year amidst the lush green mountains covered with the terraced tea plantations. The monsoons months between July and September might feel a bit humid, so the best time to visit Munnar is after September when the retreating monsoon makes the climate the most favorable for tourists. Interestingly, the tourist season in Munnar is during late August till mid-March. 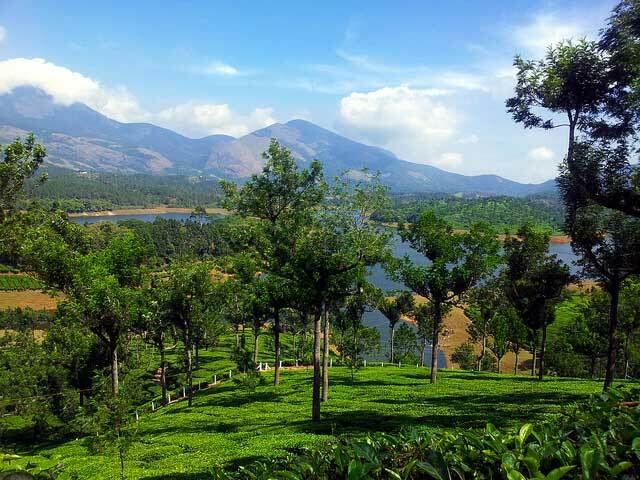 Famous for its tea plantations, Munnar is also famous for its rich reserves of flora and fauna. It is a home to the highest peak in southern India which attracts a large number of adventurers and trekkers. The trek to the picturesque hills and the enchanting surroundings has made it one of the best hilll stations in Kerala. The winding pathway amidst the green hillocks and tea plantations make it a shutterbug’s delight and is visited by thousands of tourists each year who enjoy the spectacular views and relaxing and fresh air of Munnar. Here is the list of most popular places to visit in Munnar. Eravikulam National Park, Mattupetty, Pallivasal, Chinnakanal, Top Station, Tea Museum, Atukkad Waterfalls, Blossom Park, Pothamedu View Point, Echo Point, Naimakkadu Waterfalls, Marayoor and Salim Ali Bird Sanctuary are few of the several attractions that the hill town of Munnar houses. Reaching Munnar is a cake walk, as it is in close proximity to the Cochin and the Madurai airports, both of which are less than 150 kilometers from Munnar by road. The nearest railway stations to Munnar are in Aluva, Ernakulum and Madurai, all of which are easily accessible via taxis and buses. Munnar is well connected with all the major cities in Kerala via roads and can be travelled by buses, taxis and cars etc. One must be careful while driving in Munnar for the first time as the roads are full of curves and twists. Being a major tourist town in the state of Kerala, Munnar has no shortage of accommodation facilities. From cheap lounges to luxury hotel chains, Munnar has it all to suit every type of tourist budget. Getting around the town is pretty convenient via the buses that run in every 45 minutes. Alternatively, taxis and auto-rickshaw are also available at fairly cheap prices for visitors to get around the town. When visiting during the colder seasons from November till February, walking or taking a cycle-rickshaw is the best way to enjoy the surroundings.